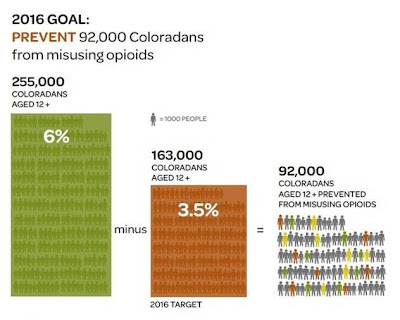 Prevent 92,000 Coloradans from misusing prescription pain killers in the next three years. This may seem like a lofty goal, but as one of CDPHE's winnable battle priority areas, prescription drug misuse prevention is an injury priority that we can impact. The Injury, Suicide, and Violence Prevention branch at CDPHE hosted a round table planning meeting on prescription drug misuse in Colorado last Friday. The event was held in partnership with the Governor’s office and other state agencies convening 83 stakeholders from around the state addressing this issue from multiple perspectives. Participants generated recommendations to reduce prescription drug misuse that will be incorporated into a statewide strategic plan to coordinate efforts to reach the winnable battle goal shown above. The "ability to gather a variety of opinions and parallel approaches into a single discussion to create synergistic goals and action plan." "Hearing diverse perspectives all working toward the same goal. It was encouraging"
"This was a great use of time - one of the better meetings I've participated in over the last 13 years." "Hopefully we can continue the discussion to help forge concrete action plans around implementation." You can read more about the event, its role in the Governor's Prescription Drug Abuse Reduction Policy Academy project, watch video of the morning speakers, and read more information from each of the perspectives on this issue from the Violence and Injury Prevention Network's webpage.